Despite its otherwise squeaky clean reputation, Singapore is now one of Asia's top gambling destinations. Although you will find just two commercial casinos in the republic, both properties are spectacular by any measure. Resorts World Sentosa and Marina Bay Sands are more than just home to world class casinos that rival the best spots in Las Vegas, Monaco, and Macau. Both properties offer awesome entertainment for the entire family. 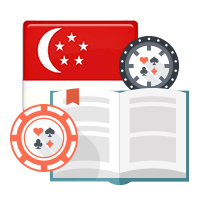 The most interesting thing about Singapore's gambling culture is that it is geared towards tourists. In fact, the government has enacted major barriers to make it difficult for locals to gamble. In the name of social responsibility, casinos can't advertise or even promote themselves within the city state. Citizens also need to purchase a costly $100 24-hour day pass to visit a casino. Fortunately, Australians and other tourists are exempt. It's no accident that the country's two casinos are part of massive resorts. By law establishments can dedicate no more than 5 percent of their space to gambling. Yet everybody knows that these resorts still generate most of their revenue from betting. Even though there are only two casinos, Singapore is now a more popular gaming destination than Las Vegas. It's also much closer to Australia than Macau, which is now the globe's gambling capital by a landslide. Even with only two casinos, Singapore boasts 30,000 square metres of gambling. That's more than Melbourne or any city in Australia. You'll have no trouble finding new and old favourites at stakes that work with your budget. In addition, both properties are new and modern, having opened earlier this decade. Singapore is surprisingly close and affordable. With return flights on budget airlines available for as little as $350 return, you won't have to deplete your gambling budget on transportation. Compare that to Las Vegas, Macau, or any spot in European and you'll be laughing. There's plenty to do in Singapore besides gambling. The city is famous for its nature trails, gardens, temples, museums, and shopping. Yet the resorts are brimming with attractions like theme parks, aquariums, fabulous shops, nightclubs, and fantastic restaurants. Both spots are perfect places for every member of the family. Marina Bay Sands and Resorts World Sentosa are both great places to gamble. Yet at the same time, quantity matters as much as quality to some players. If you prefer making your rounds and trying your luck at several casinos, Singapore may fall short in that respect. If you're used to pervasive gambling culture and distinct casino experiences available in Las Vegas or Macau, you may find yourself wanting in Singapore. As boring as it is to talk about the weather, Singapore does have random air pollution from June through October. If you have a heart condition or asthma, you might want to check the forecast and not make plans too far in advance. Like many Asian metropolises, Singapore is densely populated. It can make Sydney and Melbourne look like the outback by comparison. If you don't like crowds, Singapore probably won't be your favourite travel destination. Set on the stunning Marina Bay, this remarkable integrated resort rivals anything you'll find in Las Vegas. The Sands property is an architectural gem comprised of three hotel towers adjoined by a rooftop park that words can't possibly do justice. The five-star hotel features 2,561 well-appointed luxury rooms, tranquil spa, and fully-equipped fitness centre. Marina Bay Sands is home to more than 60 restaurants, ranging from casual fare to fine dining. Whether you find yourself craving Indian, American, French, Chinese, Japanese, local cuisine, or anything else, you'll definitely find delectable options without wandering far. You can also count on impressive buffets and celebrity eateries from the likes of Daniel Boulud, Mario Batali, Gordon Ramsay, and more. When you're ready to paint the town red or just feel like it's time to unwind, you'll find 24 nightclubs and bars. No matter what you have planned, you'll want to start by rising to the heavens above at The Sands SkyPark. Set 57 stories above, the park offers visitors monumental views of the city, the world's biggest rooftop infinity pools, and spectacular dining and drinks to match. Marina Bay Sands offers excellent entertainment that wouldn't be out of place in Las Vegas. Wonder Full is southeast Asia's biggest water and light show. The casino plays host to Broadway-quality productions like Annie, Wicked, and Shaolin. If you're looking for something interactive, the skating rink is perfect for unleashing your inner-sportsman, even if you've never laced up before. View some of the world's greatest exhibits at ArtScience Museum. If you have any luck at the tables, The Shoppes at Marina Bay Sands is home to luxury retailers like Hugo Boss, Armani, Coach, Rolex, Hermes, and more. Speaking of the casino, Marina Bay Sands has 15,000 square metres of gaming space that's open all day and night. The casino has designated smoking and non-smoking areas so that all players can play in complete comfort. Patrons will find 2,300 electronic games, including pokies of all styles, video poker and digital baccarat, roulette, as well as sic-bo. As you would probably expect, there are plenty of progressive jackpots up for grabs. If you prefer table games, you'll find over 500 throughout all areas of the casino. Enjoy games from around the world. Try your hand at American or European roulette, no commission baccarat, power baccarat 98, 7 up baccarat, blackjack, roulette complete bet, blackjack lucky 8, pontoon, sic bo, fortunate pai gow poker, royal three pictures, Singapore stud poker, pontoon pandemonium, fortune six, craps, and so many more. Minimum table bets start at around $10 AUD, but the electronic and semi-automated games offer lower minimums. It's also possible to bet thousands if you're a high roller with several VIP areas. The biggest shortcoming of the casino is the lack of a poker room. This is somewhat surprising given the number of Americans, Europeans, and Aussies who visit the property. Aside from this omission, the casino is better than anything you'll find at home. Located off Singapore's south coast on the island of Sentosa, Resorts World can take credit for being the region's first licenced casino. Having opened in early 2010, the property beat Marina Bay Sands to the punch by a few months. Like its counterpart, gambling is just a fraction of the resort's winning formula. Sentosa is a total entertainment destination. Don't get us wrong! The casino itself is tremendous, but the attractions are even better, especially if you plan on bringing your children. The resort is home to Universal Studios Singapore, which, like its Florida namesake, lets you ride the movies. The S.E.A. Aquarium is one of the planet's largest marine showcases, while Dolphin Island lets you get up close and personal with aquatic marine mammals. The Adventure Cove Waterpark is spectacular for kids and the kid in you. The Maritime Experiential Museum and Trick Eye Museum are educational and fun. K-live Sentosa brings you Korean pop with a holographic twist. Visitors can also count on great concerts and shows including many Aussie favourites. Like most massive resorts, you'll find a wide variety of accommodations. With 1,500 rooms spread over 7 hotels, there's something for everyone. Festive Hotel, Hard Rock Singapore, Crockfords Tower, Genting Jurong, Hotel Michael, and Equarius Hotel all offer modern rooms and suites. Yet Resort World Sentosa is also famous for its unique lodging. The magnificent Ocean Suites let you stay partially beneath the sea with an awe inspiring marine life view. There's even TreeTop Lofts, which gives you the opportunity to stay atop a canopy of trees nestled in the lap of luxury. No matter where you stay, you'll want to visit Essence of ESPA for spa treatments, massages, and full body therapies. Resorts World Sentosa is home to some of Singapore's finest dining. Whether you are seeking to sample local tastes, love European flavours, or desire elevated Asian menus from Japan and China, prepare to be beyond satisfied. You'll also find great bars and lounges with incredible cocktails and equally amazing live entertainment. The Resorts World Sentosa casino is open 24 hours daily and features an impressive selection of traditional table games, pokies, and electronic games. With over 500 tables to choose from, it's easy to play baccarat with or without a commission, blackjack, blackjack switch, Caribbean stud poker, craps, money wheel, pai gow, poker, pontoon, progressive Texas hold'em poker, three card poker, European as well as American roulette, three pictures, tai sai, and more. Betting minimums start at roughly $10 AUD, but some games like blackjack may cost you $25 AUD per hand. Luckily there are cheaper electronic games if you can't stomach the cost. If electronic games are more to your liking, you'll find over 2,400 pokies and digital games. Choose from classic machines, video slots, and electronic sic bo, non-commission baccarat, or roulette. Don't forget to try your luck at the networked progressive jackpot games to play for millions. Aside from the main sprawling gaming area, VIPs can take advantage of three exclusive clubs. Use your Genting Rewards status to gain entry to Maxim, Maxims Platinum Club, and Crockfords Clubs for an intimate gaming experience, phenomenal food, brilliant beverages, and matchless service. You don't have to love greenery to appreciate the beauty of Gardens by the Bay. It's a gorgeous spot day or night. The Singapore Zoo is quite large and features lots of interesting species. It's one of Asia's most popular zoos. The F-1 Singapore Grand Prix is always lively on and off the track. Be sure to get your tickets to the annual event if you plan on visiting Singapore in September. Fratini La Trattoria proves that the best Italian cuisine isn't it Europe. The menu is authentic but full of modern twists and is reasonably priced. Jo'l Robuchon Restaurant is easily the country's best dining establishment and the only one to earn 3 Michelin Stars. Savour what the celebrity chef has in store at Hotel Michael at Resorts World. Health conscious eaters who aren't willing to forsake taste will want to visit The Garden restaurant. Enjoy vegetarian fare and organic meats in a serene setting or by the pool. Whether or not you gamble, the Lion City is always roaring. It's simple to have a great time at the tables and beyond at either Resort World Sentosa or Marina Bay Sands. Unlike other global gaming capitals, Singapore is a relatively new player on the scene. That means you won't have to deal with dated decor, tired amenities, or a stale selection of games. It's definitely worth the short trip to the island city-state to put your luck to the test.